Okay, I know what you’re thinking…shop my own closet?…LAAAAME. I swear, it’s fun. You haven’t seen your fall clothes in months, and if you’re anything like me, you’ve forgotten all about some items. I’ve decided to show some fun looks from my closet, as it is now. I’m focusing on transition looks right now, and trying to work in some spring/summer pieces like dresses, skirts and shorts. I 100% stand by shopping your own closet, especially before big purchases. Here are my top 3 fall transition looks. 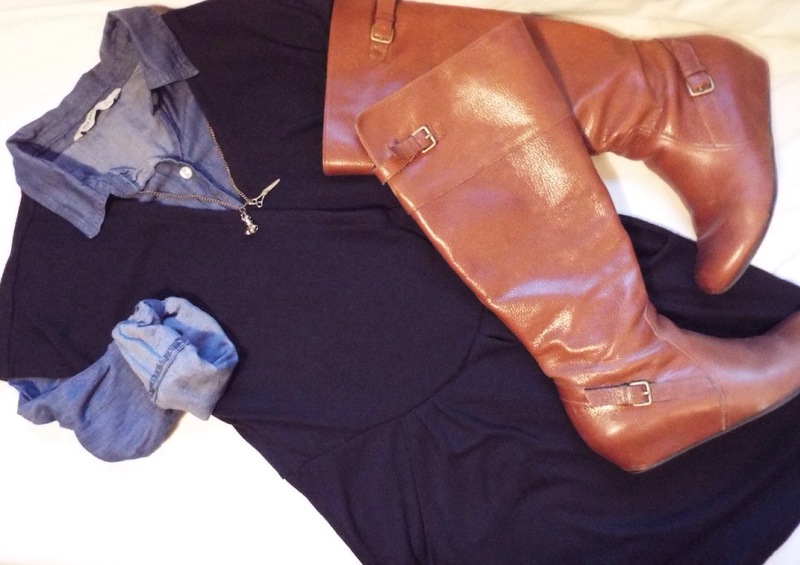 Look 1: Here I have layered a Chambray button down under a black wrap dress with knee high cognac boots. Look 2: This hunter green crew neck sweater looks so rich over an ivory silk button down. Add some black shorts and leopard flats to complete the look. Look 3: This striped sweater with a knee length denim skirt and oxford wedges is easy aaand pulled together. I may wear this tomorrow.